Newly developed Multi patches take full advantage of new S.A.G.E.™ (Spectrasonics Advanced Groove Engine) technology with multitrack grooves which show the full potential of BackBeat with Stylus RMX. Hi-Fi" sound that adds a whole new dimension to what Stylus RMX can do. Dont miss this this best-selling Xpander if you're looking for inspiring "straight-ahead" drum grooves that aren't overplayed! Big, Dark and just a little bit scary! Diego shows a whole bunch of different Basses in this track, starting with the Blown OSCar sound. He then adds some of the Finger Funk Electrics and ends with building into some of the radical sync shreds that Trilian can do. Great example of the original Trilogy Rock and Roll bass which is also in Trilian, which has heavy overdrive in the samples and some serious attitude! Notice also how well all the synths sounds work together here....they are all from Trilian too. The Classic Pick Bass is used in the bridge. Very high quality and it is clear that much time and effort has been put into it....an immense array of stunning grooves -- all played on real acoustic kits, by real people! There is nothing run-of-the-mill about the quality of these performances, and there is a great variety of them, from basic 'Billie Jean'-type pop to highly-intricate shuffle, the latter capturing every nuance of snare stroke with great subtlety...The benefits of the Groove Control technique are considerable, allowing easy tempo changing without affecting timbre, and the power to create groove-quantize templates to use elsewhere in your track...I suspect that a staggering amount of time has gone into its presentation on Backbeat, to ensure that the grooves maintain their integrity...If you have a need for exceptionally well recorded standard drum grooves that really do groove, this is a library you should audition. Added to Retro Funk, it contributes to an extensive library of formidable grooves." 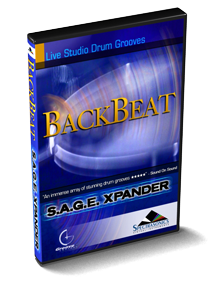 "Backbeat is most certainly a classic-style drum loop collection that is a cut above the rest. The variety and quality of all of the loops is first rate and very professional sounding, rivaling anything that you'll hear in any number of high-profile pop or rock tracks. The performances are also extremely tight and dynamic - they have life, and perform flawlessly...if you're looking for loops with an acoustic "classic rock and pop" feel, Backbeat is a library that you should own....For $99, Backbeat is as close as many of us will get to having four really great drummers performing at our command. " "Excellent! Spectrasonics titles are always so much better than all the other products out there -always setting the standard for quality and musicality."